Newspaper Rock: "Teach our history, keep Native mascots"
How about "Dump the false or misleading mascots and teach our real history" instead? The idiot is looking at the users' intent, which presumably is not derogatory. He isn't looking at the effect, which is a different matter. We don't care if these mascots seem noble and honorable to you. We care about the proven harm that results from racist stereotyping. Whether there's an intent to harm or not. "Teach Native history, which contradicts the Native mascots, but also keep the Native mascots." Brilliant plan to make Native history clear! Like, "Teach myths about Columbus, the first Thanksgiving, and Washington chopping down a cherry tree. But also teach the truth." You inspired me to implement your vision of American history, Chairman. Here you go! 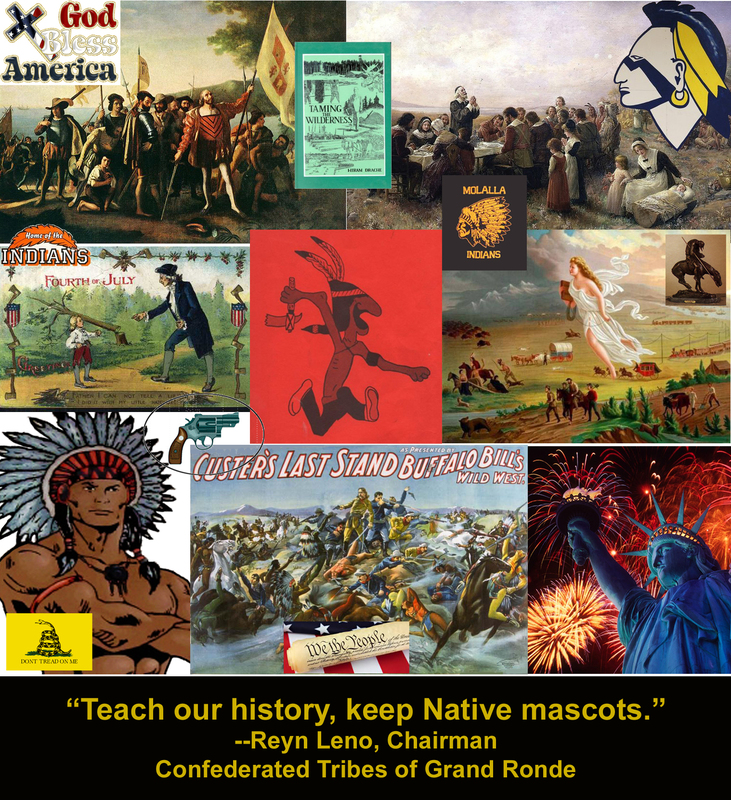 Teaching your history with Native mascots, just as you requested! By Sam SachsI have spoken to and heard from literally hundreds of students, elders and members of the Native American community in our state who mirror what the research says and who support the elimination of these mascots. I've witnessed as a busload of Native American students from Portland traveled to Salem to testify in favor of eliminating the use of Native American mascots in Oregon schools. When these students witnessed the hate and vitriol spoken by those who claim to honor Native American people by continuing to use these mascots, they got back on the bus and went home, without speaking a word, too traumatized, disgusted and shocked by what they had witnessed. Leno and many others want us to believe that the only way we can educate our students, our state and many people about Native American culture is to somehow have an agreement with the dominant culture that allows them to continue to demean, disgrace, belittle and disrespect Native American people through the harmful use of images and words that don't respectfully or accurately represent Native American people in the state of Oregon. The nine tribes in Oregon don't represent every Native American person in the state of Oregon. Leno writes that "we have heard from Native Americans who belong to tribes outside of Oregon who believe all Indian mascots should be banned." This is misleading, especially since the two Native American students that raised this issue back in 2006 were Oregon students, not outsiders. The Oregon Board of Education and the state of Oregon have the legal obligation and responsibility to ensure that all students gain an education in their schools free of discrimination, whether intended or unintended. This is nonnegotiable even with the curriculum on Native American history and culture. The Board of Education has failed in its responsibility to fulfill this promise and lawful requirement to the Native American students even though the research and countless human rights and civil rights organizations in the state and throughout the country support the elimination of these mascots.Good job, Sam Sachs. Leno is full of it when he talks about out-of-staters. Get a clue, clueless. No Oregon mascot that I know of represents a particular Oregon tribe. Every Oregon mascot represents a Plains chief or warrior, an Eastern Woodland (Iroquois) warrior, or a generic Indian. As an Oregon Native, you're less qualified to judge these outside cultures, not more qualified. Someone from a Plains or Eastern Woodland culture is exactly whom you should be listening to. If you were more educated about other cultures, maybe you wouldn't say such ignorant things about stereotypes representing your culture. For more on the subject, see The Grand Ronde Indians Mascot and Grand Ronde: We'll Decide About Mascots.